For this week's Ranked!, we ranked our favorite television aliens. We narrowed our extensive list down to our twenty-two favorites. Did your favorite make the cut? Find out below! Worst vacation ever: instead of taking the kids to Disneyland, a trip your lovely daughter's been begging you for forever, you decide to take everyone camping instead. Sure, you try selling it as an "expedition" to make it seem cooler to the children, but they know the truth. The kids soon get tired of fishing and hiking, so you decide to do a little whitewater rafting, only to take a wrong turn and stumble upon the world's only waterfall/time portal. What are the odds? When you wake up, you find yourself face to face with dinosaurs who want to eat you and the kids. And the worst part of it all? Your only friend is a tiny little monkey boy with limited English. Nice job, Dad! 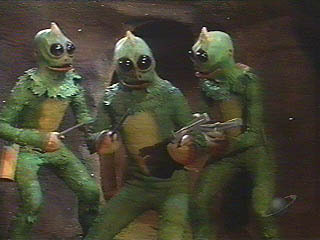 And then there's the Sleestak, the inhabitants of The Lost City. The Sleestak were primitive, slow-moving reptilian creatures who were content to patrolling the perimeter of their city, looking for animals and people for food or as sacrifice to their God, the unseen beast that lorded over them by moaning constantly from its pit of smoke. Sure, there was a Sleesatk who could talk and wore a shirt (but still went around pantsless) named Enik that you seemed to buddy up with and respect just because he didn't try to kill you all. But face the facts: dude fell through a time portal as well, so he can't really be the most intelligent Sleestak from the future, you know? Unlike most of the TV aliens on this list, the good Doctor actually has an entry in Guinness World Records: "Doctor Who (BBC, UK) has chalked up 769 episodes as of June 2010, encompassing 212 storylines including a full-length TV movie. This total does not include spoofs, spin-offs or webisodes." It's also considered the most successful sci-fi TV series ever created--and that was all recorded at least a year ago. If you're not familiar with him, the Doctor is a Time Lord, an alien who travels through space and time in his spaceship called the TARDIS, which looks exactly like a blue British police phone booth. The Doctor is generally charming, brilliant, a little bit unsettling, and endearingly funny. 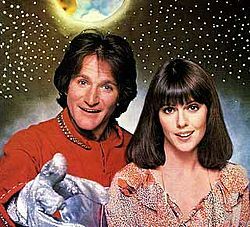 He takes a human companion with him (generally a female) and together they travel thru space and time solving problems and having adventures. Sometimes their travels take them back into human history: they've visited with Queen Elizabeth, Shakespeare, and so on. Sometimes they travel to alien worlds. Sometimes they have to battle evil aliens like the Daleks who want to exterminate humans. But the most ingenious part about Doctor Who? The doctor can die and reincarnate into a new body, so if the lead actor wants to move on to a new gig, they can just recast and voila! New Doctor, new stories, new fun and adventures. And the Doctor has been played by some brilliant actors, especially recently. 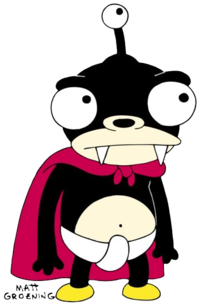 There have been multiple spin-offs (incidentally, Torchwood's Captain Jack is hubba hubba), animated series, books, and even live stage plays (there's even a live stage extravaganza in the works that is slated to open in 2012). "I'm going to blow up the Earth." 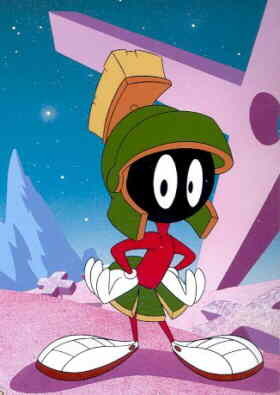 It's a signature phrase from the cartoon character Marvin the Martian. Marvin is one of the few impressions that I can (barely) do. Okay, he's really the only one. And I've been saying this phrase since I was a kid raised on Looney Tunes. Recently, I got to dust off my impression because my kids have been watching Looney Tunes. The fact that I can kind of do the voice has brought me a little bit of cred with my brood. It's a testament to how cool Marvin is that he is one of the characters they have gravitated towards on their own. Marvin captured my imagination when I was a kid and it's comforting to know he's still doing it after first being introduced in 1948. When I was seven years old, I went down the street to play with one of my friends. When I got there, he was just starting to watch a TV show I had never seen. I watched it with him and, by the time it was over, I had forgotten all about playing. I ran home to tell my Mom about this incredible "new" show called Star Trek. And thus began a 39-year (and counting) obsession. I've avidly watched every incarnation of Star Trek that has appeared since then. Many fans are purists, and the original series will always be their favorite. I'm not one of them. My favorite--and I'm in the minority here--is Deep Space Nine. But, like the purists, the original series and crew will always be very important to me. Apart from the cool technology, what makes Star Trek great is its ability to tell allegorical stories about current events (or, in the case of the original series, events of the 60's) using alien beings and situations. And Spock is the linchpin that connects these stories of other worlds to humanity. Spock is half-human, half-Vulcan. His Vulcan culture demands the strict control and suppression of all emotions, while his human nature is constantly at war with this stifling control. As such, Spock acts as a two-way lens for the viewer. 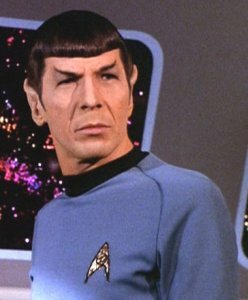 From one direction we can see, through Spock, the folly of uncontrolled emotion and the consequences of acting on impulse rather than seeking a more dispassionate and logical solution to a problem. From the other direction, we can see the advantages of putting logic aside on occasion and allowing compassion and human instinct to override what is "logical" and do what is right. This is what makes Spock both a great character and a great literary device. He can point out just how silly and reckless human behavior can be but, on just as many occasions, he learns through his interaction with humans that sometimes the logical choice is to act illogically.